Sue Ziegler in front of a collection of her paintings. In two short years, Southern California artist Sue Ziegler transformed her drawing skills from scribbles into world-class, award-winning talent. “I couldn’t even draw stick figures until I was in my 50s,” Sue said. 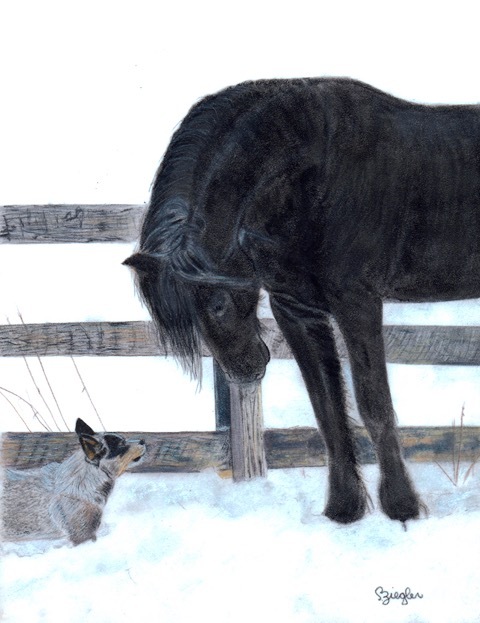 One of her early pieces, titled “Sunlight,” featuring a pony chomping hay, was a winner in Colored Pencil Magazine’s annual international art competition in 2015 and the piece was subsequently featured in the publication’s 2016 calendar. 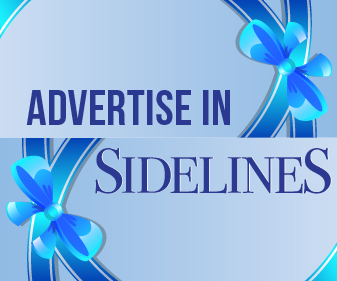 “That was very encouraging to me, and I felt that I might be on to something,” Sue said. Since then, her artwork has also appeared in two books and multiple magazines. 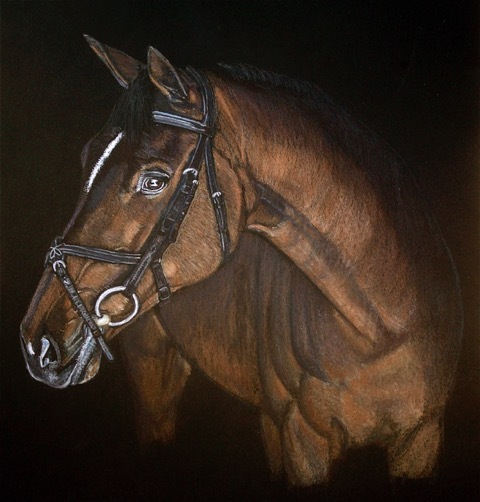 She’s also received numerous awards including accolades from Fine Art Connoisseur magazine in an online review that described that her piece, “Alpha Look,” as a highlight of the American Academy of Equine Art Fall Show. Sue’s childhood was filled with horses. 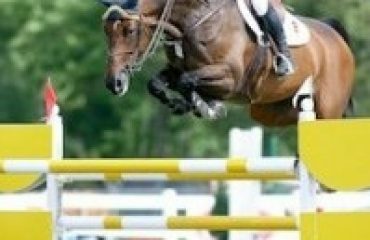 She participated in 4-H and was surrounded by Thoroughbreds in her hometown near Saratoga, New York. 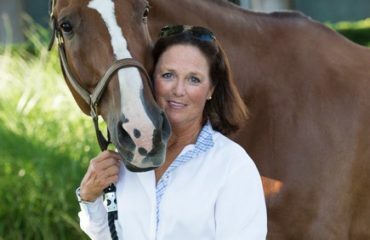 It wasn’t until the purchase of a new home in Southern California that she fulfilled a lifelong goal of owning a horse. “I’d finally realized my childhood dream,” she said. Mister was her first horse. 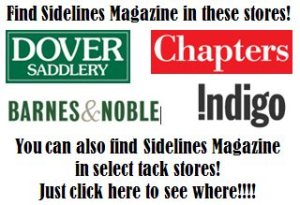 He was a Tennessee Walking Horse and she was able to ride him without saddle or bridle. “We were so connected it was like he could tell what I was thinking,” she said. Aside from the strong bond the two shared, Sue was drawn to his character because he was so curious and always into something. “One of my favorite photos of him shows him feeding a tumbleweed to the neighbor’s goat through the fence,” she said. Watching Mister, and eventually the other horses that joined him, grazing in the pasture simply wasn’t enough. 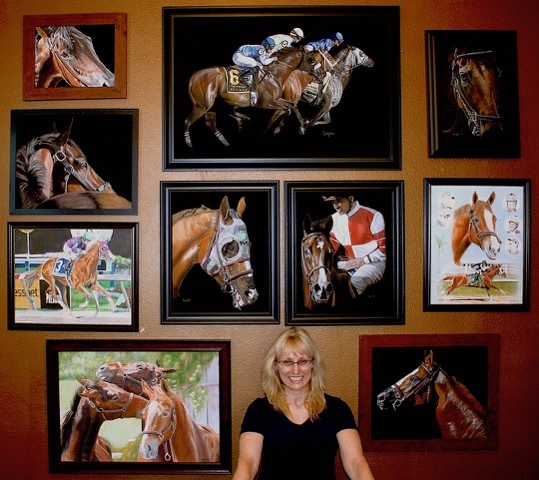 She wanted to fill the walls of her home with images of her horses. She began taking photos, and then discovered an artist who was creating beautiful custom drawings in a loose impressionistic style. “I wasn’t able to afford her work, but was inspired to attempt drawing,” she said. Sue downloaded how-to-draw books on her Kindle and took classes to study the drawing process. Much to her surprise, she discovered that the artistic style she enjoyed viewing was drastically different from what she enjoyed creating. As a viewer, she prefers impressionistic artwork, but as an artist, she prefers realistic or even hyper-realistic style. “Horses are so incredibly majestic exactly as they are, and I just strive to capture that, drawing a person’s attention to their power and expressive beauty,” she said. Because of her interest in fine detail, graphite was the best fit. She added colored pencils and practiced non-stop. Within a year, she had created more than 100 drawings. While she favored colored pencils because of their ability to capture fine detail, the amount of pressure required to create highly-detailed work caused an old injury in her hand to flare up, forcing her to stop for a few months. During this break she discovered pastels, which require less hand pressure. 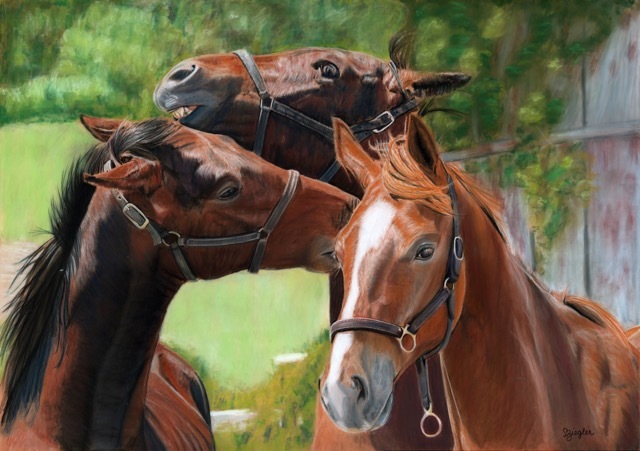 Horses of any breed or discipline and dogs find themselves memorialized on her canvas. 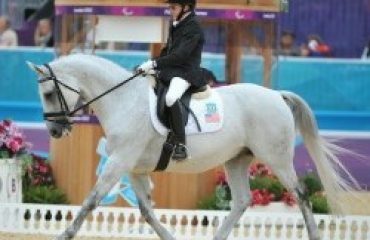 Mister, the horse that ignited the spark that turned into a passion, is featured in numerous drawings. Two, “Gone Too Soon” and “On My Drawing Board,” capture the love Sue had for this horse. 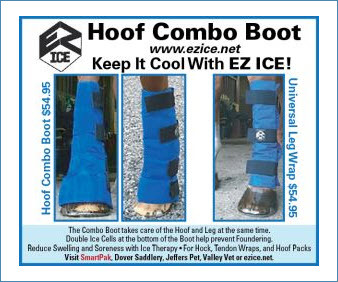 “We lost him to colic last year, but he lives on in these pieces,” she said. Her two German shepherds, Hero and Una, are also featured in much of her work. “The thing I love most about drawing dogs is capturing the sense of fun and the purity of love in their expressions,” she said. 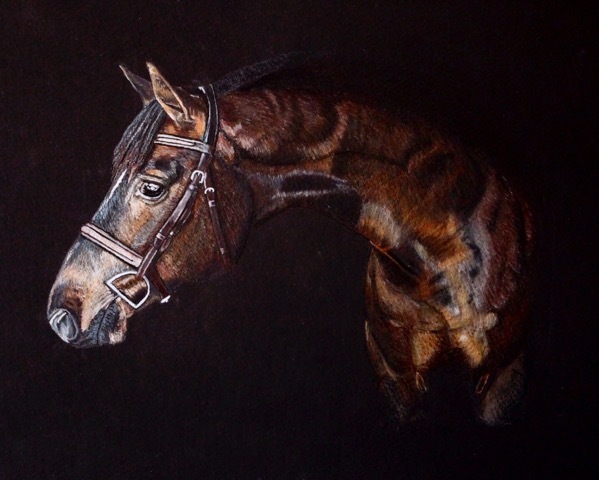 Drawing on her roots in Upstate New York, Sue frequently chooses to draw Thoroughbreds. Her great-uncle was part owner on a few horses and her dad grew up spending time there. Continuing the family tradition, her father took her to the track. 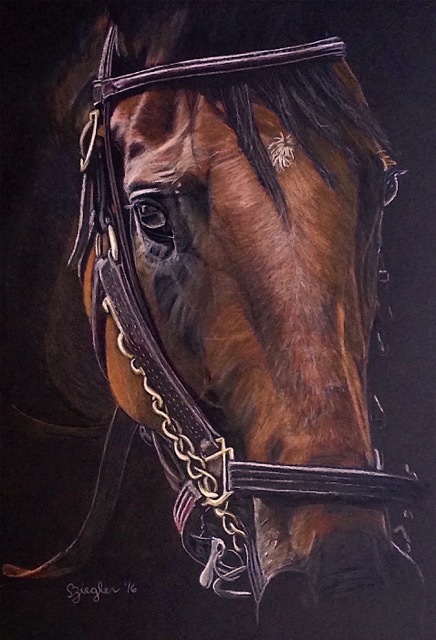 Her love for the track shows up in the numerous Thoroughbred-themed pieces she’s produced, some of which are on display at the Spa Fine Art gallery in Saratoga and also in the Solaris Gallery in Versailles, Kentucky, the home of American Pharoah. She insists that having a favorite piece of work is similar to having a favorite child: you really love them all, so it’s hard to answer that question. But, she admits, two stand out among the rest. One is “Nyquist,” a portrait of the 2016 Kentucky Derby winner. This won a Special Merit award in the Light, Space, Time competition, which drew more than 900 entries from 24 countries. “I felt for the first time I was really able to capture the realism I’d been hoping to achieve,” she said. The other, “School’s Out,” spotlights three young Thoroughbreds having fun in turnout. “I really love those three rascals. You can tell they’ve really been up to some shenanigans and it always makes me smile,” said Sue. The reference photos, taken by Heather Moreton and provided by Gemini Stedl, were extraordinary. “The talented photographers who have allowed me to reference their amazing photos for my art are extremely generous. So much training, time and talent goes into the creation of each of these photos and I’m deeply grateful,” Sue said. 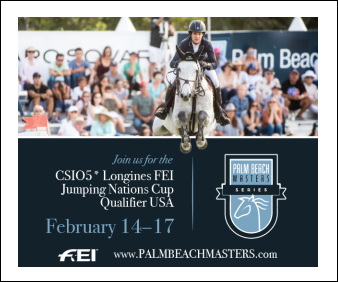 Although horses and dogs are her favorite subjects, her work isn’t limited to these two species. She’s dabbled in nature and abstract subjects as well. In addition to creating artwork found through daily inspiration around the property, she works on commissions. Her commissioned work started casually through a Facebook page called “Hags with Nags” that she joined after buying her first horse. She started sharing her early drawings in this group and received tremendous support and encouragement. 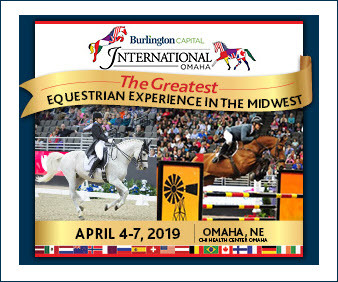 “This wonderful group of women is not just my go-to place for all of my new-owner horse-related questions, but continues to be proudly supportive of my growth as an artist,” she said. 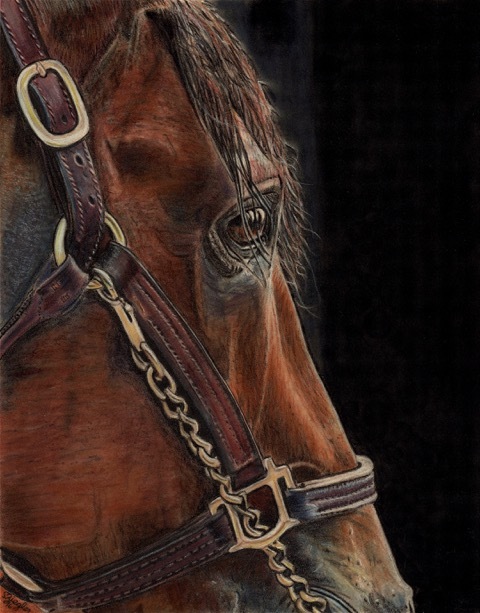 She draws many non-Thoroughbred horses and enjoys the uniqueness of each horse she draws. Her horses and her artwork bring her so much joy and she hopes it brings joy to others as well. “One of the best compliments I’ve received is when I had a photographer tell me that my art felt more real than her photograph. That, for me, is success. My inner child is having a blast,” she concluded. For more information, visit www.szieglerart.com.